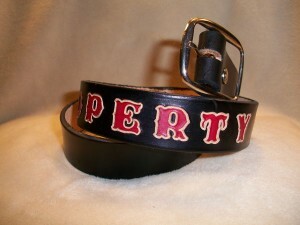 This hand tooled leather belt shown in Black w/ natural tooling around the outside of the letters. If you want the belt the way it appears, just order black. The name will be red. Also available in other colors, just call for personalized belt orders.